Why such a small sump? Just doing my "put it away for the season" oil change and I'm curious again why the 4age 20 valve has such a small oil sump. Around 3.2 liter depending on whether you have an oil cooler and the size oil filter you use. Does anyone know the engineering rational behind this. Re: Why such a small sump?
. I noticed that also, the oil sump. (Oil pan) is very different in size also it the 16v 4age oil sumps are bigger! tucked up high enough to be out of the way of accidental scraping damage. On the AE86 the bottom of the sump is about 1/4" higher than the front crossmember. The position of the front cross member also dictates that the sump be a "front bowl"
sump has to be shallow as it sits on top of the cross member. So packaging issues. (towing) or high temperatures (Death Valley). stock AE86 sump seems to be fine for stock and mildly modified engines. cooling and sufficient oil quantity to keep the pickup submerged under high lateral G's. Also of note is that the RWD oil pan is different than the FWD oil pans. It has grooves in the bottom of the lowest part of the pan, running front to rear (looking at the timing belt side of engine), whereas the FWD pan does not. much more significant..... the earlier rwd pans are 4 quarts, while the later pans are less volume. If you look at the pan from the front of the engine, there is a "kick-in" on the intake side (axle side in transverse layouts). having more oil available is never really a bad thing... the MRP pan is 4.8 liters (5 quarts) so having 25+% more volume helps keep the oil cooler, and allows for sustained high rpm operation. 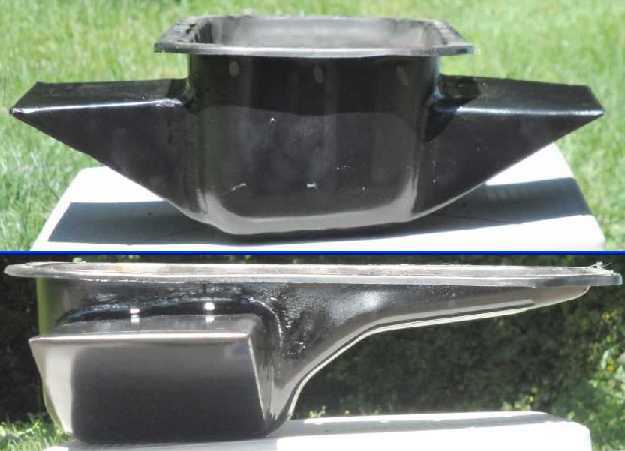 About 10 years ago I was working on a simpler/cheaper solution then the MRP pan.... also 5 quarts... "Batpan"